The technical observations below are a response to numerous articles over the weekend that included some sort of reference to the following: “1987—22% one-day decline, 36% decline from high to low, “…the Next Crash…,” “the Good, the Bad and the Ugly…” etc. Stocks favored over Fixed Income, from a longer-term perspective. 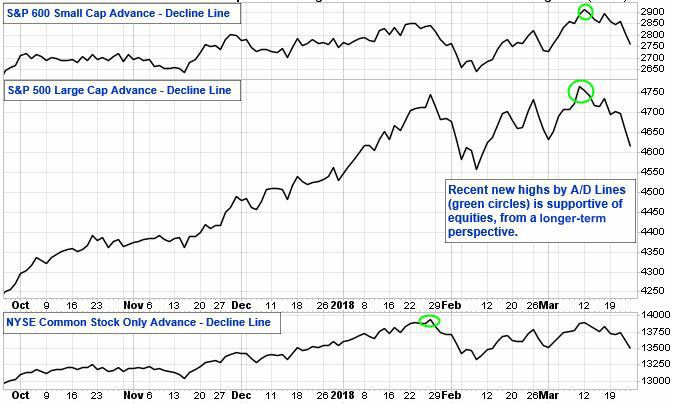 Advance-Decline analysis remains supportive of equities, from a longer-term perspective. Relative strength trend of Commodities versus stocks is bottoming. This suggests having some type of exposure to the commodity universe. Gold: Lengthy bottoming process isn’t complete, but it continues. A multi-month consolidation period would not be unusual. Refer to report dated 3/20/18 for specifics. S&P 500 is in “retest” mode (last Friday’s sell-off was less pressure-ridden when compared to the early February low, a positive development). Sentiment: Total Put-Call ratios reached levels that suggested the odds favor a bounce up off support. If this proves correct, the key to the sustainability of any future rally attempts will be for “pessimism” to continue, and for buying demand to remain strong, evident by a string of days during which NYSE Advancing Volume leads NYSE Declining Volume by at least a 9 to 1 ratio, or some type of Breadth Thrust. Odds favor 1% daily moves, both up and down, will continue. Day Hagan Asset Management appreciates being part of your business, either through our research efforts or investment strategies. —Written on 03.26.2018. Chart sources: Stockcharts.com.